Sweet and sour is one of the few very early and famous fusion dish created by Cantonese restaurant many years ago mainly for the Western customers. This dish is firm favourite not only to Westerners also most Chinese and others in the whole world. No further introduction is required. If you like sweet and sour you will like this. There are so many variations of sweet and sour recipes. Normal recipe is to coat the meat in batter and deep fried. The sauce must be sweet and sour and looks appetising, sweet and sour ingredients can be anything. The battered pork should remain crispy coated with the S&S sauce. 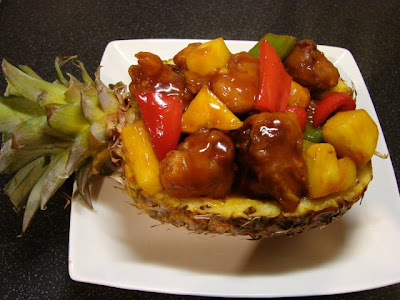 Accompanied vegetables usually onion, sweet pepper and many with pineapple like this recipe. Here is my recipe, enough for 3 - 4 people with one of two other dishes. Cut pork into chunks about 2 x 1.5 cm. Marinate the pork with soy, ground pepper, sesame oil and egg. Leave to marinate for at least one hour. To prepare the pineapple, cut off 1/3 of the pineapple lengthwise and hollow out the pineapple flesh with a small knife (curved knife is best). Keep 1 cup of the flesh for this dish, remaining for other use. Mix the sauce ingredients and set aside. Cut the vegetables and pineapple into bite size. Heat wok or frying with oil till hot and keep temperature around medium heat. Mix cornflour with baking powder and salt then stir into the meat with the vinegar, mixed till all combined. Once oil is hot enough, test by dropping a little batter into hot oil, if sizzle it's ready. Spoon meat pieces one by one into oil and deep fried for few minutes till the batter is brown and crispy. Do this in few batches. Drain on kitchen paper and keep in warm oven. Once you have finished deep frying. Pour oil into container. Wash wok. Add 1 tbsp oil in wok and heat till hot and stir fry with onion for about a minute, then add sweet pepper stir fried for another minute then add pineapple follow by the sauce mix, cook till sauce thickened, hot and bubbly. Add in the battered pork toss quickly so the batter will remain crispy. Put some in a pineapple case and the rest in a plate, eat while hot with plain or egg fried rice. ** You can sub pork with chicken, spare ribs in small pieces or firm fish. Deep fried fish takes less time. If you really dislike deep frying, just marinate the meat and 2 heap tbsp of cornflour and shallow fried till brown in a pan and continue with the sauce. You will need around 1/3 more meat. What's the reason for adding vinegar to the flour for frying the pork? Vinegar reacts with the baking powder making the batter fluffy and also vinegar makes any fried batter very crispy. You need to use the batter asap or the bubbles created by baking powder and vinegar will subside.